"The unassuming horseshoe crab is indispensable to human health." "Endotoxin" is often used as a general term to describe any bacterial toxin, but is more properly used to describe components of the cell surface of Gram-negative bacteria, particularly the lipopolysaccharide complex. Lipopolysaccharide (LPS) is composed of a core oligosaccharide, O-antigen a glycan polymer and Lipid A. The lipid component, Lipid A is a phosphorylated glucosamine disaccharide with multiple fatty acids and is the primary cause for endotoxin toxicity. When gram-negative bacteria enter the human body a complement immune response is initiated. Once the cell wall and/or bacteria are destroyed endotoxins are released which can lead to endotoxemia, the symptoms of which are vomiting, nausea, diarrhea, fever, disseminated intravascular coagulation, vascular collapse, organ failure and possibly death. Antibiotics will not inactivate the endotoxins, therefore detection of the endotoxin before they enter the body is prudent. What do horseshoe crabs have to do with endotoxin? Limulus polyphemus (Atlantic horseshoe crab) is protected against infection by its immune system and blood coagulation system. Because they are invertebrates, horseshoe crab circulatory and immune systems are very different from those seen in vertebrate animals. Horseshoe crabs use hemocyanin to carry oxygen instead of hemoglobin. The blue color of their blood is due to the presence of copper in hemocyanin. In place of the complex leukocyte array that make up the human immune response, horseshoe crabs rely on circulating amebocytes to detect and respond to pathogens. Inside the amebocytes are proteins that are released in response to unwanted organisms like gram-negative bacteria. 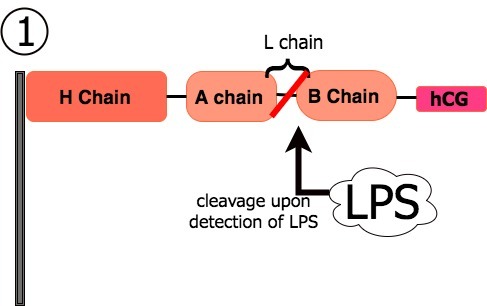 These proteins bind to and inactivate endotoxin. Assistance in wound control is moderated by components of their blood which prevent bleeding and form a physical barrier against additional infection. 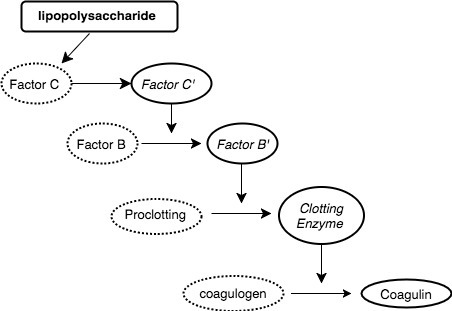 In the presence of endotoxin, a clotting cascade is invoked to activate the proclotting enzyme which is used to transform coagulogen into coagulin. The first step in this cascade involves activation of zymogen Factor C, a 123 kDa glycoprotein that becomes enzymatically active in the presence of bacterial endotoxin. 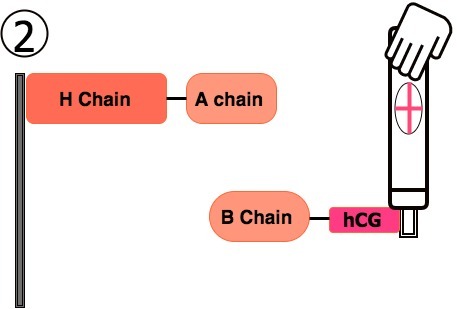 Factor C consists of an H chain (80kD) and L chain (43kD); in the presence of LPS the enzyme becomes active and undergoes autocatalysis, the phenylalanine- isoleucine bond on the L chain is cleaved resulting in a B chain (34kD) and an A chain (8.5 kD). Activated Factor C then activates Factor B which activates the proclotting enzyme. The activated proclotting enzyme then converts coagulogen into coagulin, resulting in a clotting-like reaction which isolates the bacterial pathogen. Injectable healthcare products such as vaccines and any other healthcare products such as implantables that come into contact with a patient's blood or cerebrospinal fluid must be sterile. However, processes that kill bacteria may still result in the release of endotoxin into the product. Medical products must be tested for endotoxicity before use. 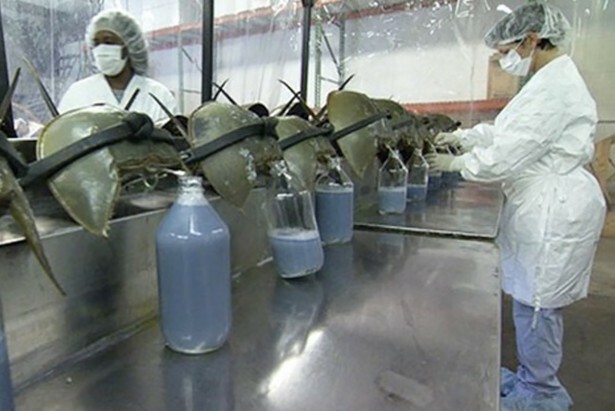 The Limulus Amebocyte Lysate test uses an extract of the Limulus polyphemus (Atlantic horseshoe crab) blood cells (amoebocytes) to detect small concentrations of endotoxin that may contaminate medical supplies. To obtain the extract, Horseshoe crabs are bled through the pericardium. A third of their blood is taken and they are released back into the water. Through centrifugation, their blood cells are separated from the serum. In order to release the chemicals from inside the blood cells, they are placed in distilled water where they burst and form the lysate. A sample is mixed with lysate and water and presence of endotoxin can be assayed by the coagulation response. 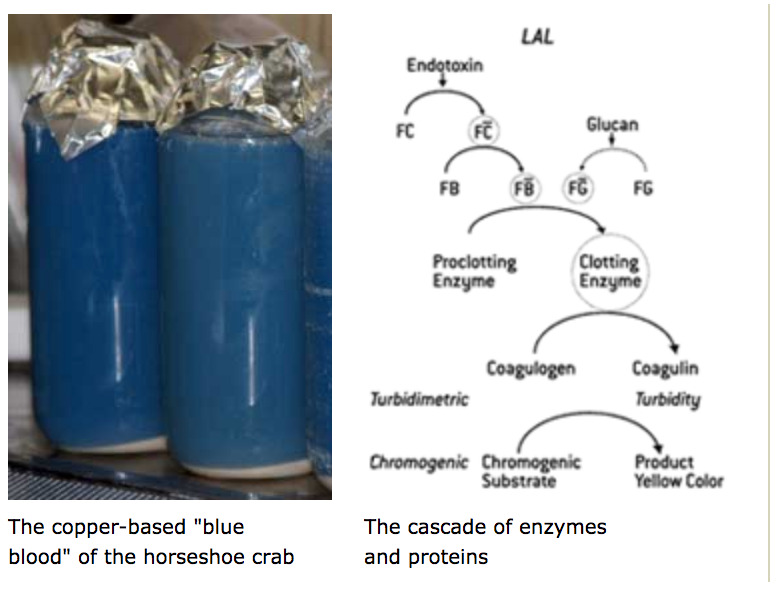 Using horseshoe crab blood is an unsustainable practice due to the impact on the crabs and the expense of the LAL assay. A third of the blood is taken from the horseshoe crab before they are released back into the water. In theory the crabs recover from this draining, however up to 30% of bled crabs die. The total population is decreasing rapidly while producers are forced to increase harvests to keep up with global demand. The LAL test is expensive: a quart of blood is sold for $15,000. Part of affordable healthcare means that the production of the products used also need to be affordable. 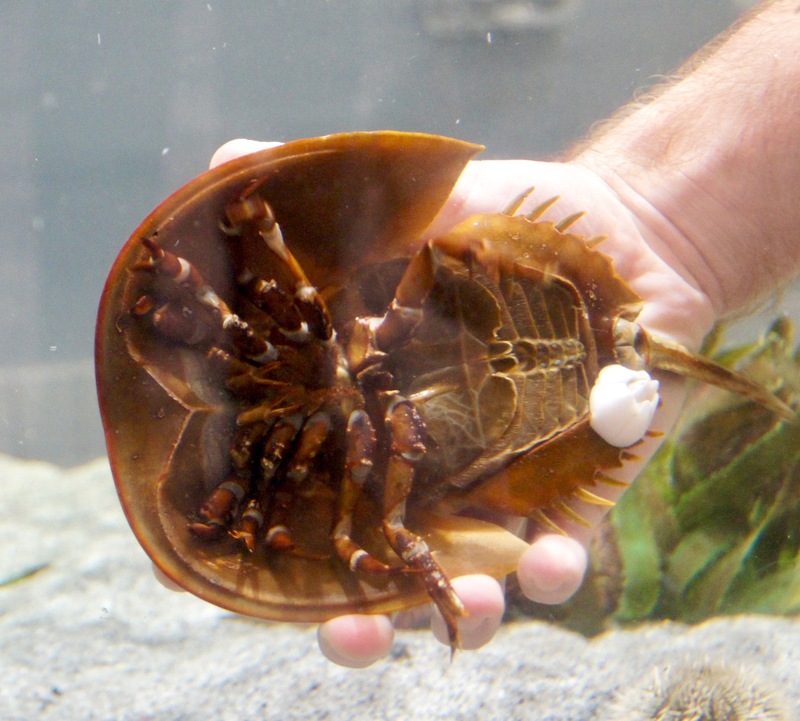 Creating an alternative form of testing using synthetic biology would alleviate both the impact on the horseshoe crabs and the overall cost of healthcare. Instead of creating a recombinant version of the entire clotting cascade we think it is more efficient to create a recombinant version of Factor C that includes a signaling mechanism to detect autocatalysis in the presence of LPS. We've chose to design a fusion protein that combines recombinant Factor C with the Human chorionic gonadotropin (hCG) beta subunit. Because hCG is easily detected with a human pregnancy test we expect that we can detect autocatalysis of the Factor C-hCG fusion protein using an inexpensive, easy-to-interpret, and portable system . The goal of our project is to create a fusion protein of Factor c with hCG and immobilize it on a solid substrate such as nylon membrane. The immobilized protein can then be exposed to the fluid to be tested; if LPS is present the Factor C fusion protein will undergo autocatalysis and release hCG into the solution where it is then detected by the pregnancy test. - - - Ecological Research & Development Group. (2013).